The L.A. Clippers showed the youth of Los Angeles how exciting STEM could be with their first ever Clippers Scifest SoCal science festival. The Clippers partnered with the USA Science and Engineering Festival, an organization who hosts the largest science festival in the country in Washington D.C. The Clippers Scifest SoCal was a two-day event with over 40 booths displaying various types of science, including animal life, aerospace technology, robotics, and chemical and natural sciences. 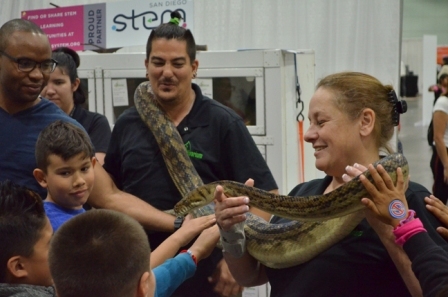 Microsoft, the EcoVivarium Living Museum, The LAPD Forensic science Division and the Los Angeles City College STEM Academy are some of the many organizations at the Scifest. The Raytheon booth featured nitrogen-cooled popcorn via Nitro Pop catering along with teaching participants about their various satellites. They allowed kids to create and shoot out straw rockets. There was also a panel of women scientists and engineers from Raytheon who talked about their work experience and passion for STEM. 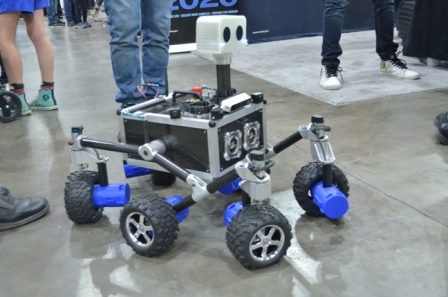 NASA showed a replica of the space rover that was sent to Mars and explained the Europa Clipper, a project they are currently working in to investigate one of Jupiter’s moons Europa. LAPD displayed an electric police car that would help lower the cost of maintenance and allow the department to use them for longer periods of time. Kids were able to participate in a Math Hoops tournament, the basketball-themed board game that requires math and probability skills for players to win. Clippers Scifest SoCal brought together children from different walks of life to learn STEM through teamwork, creativity and fascinating demonstrations.